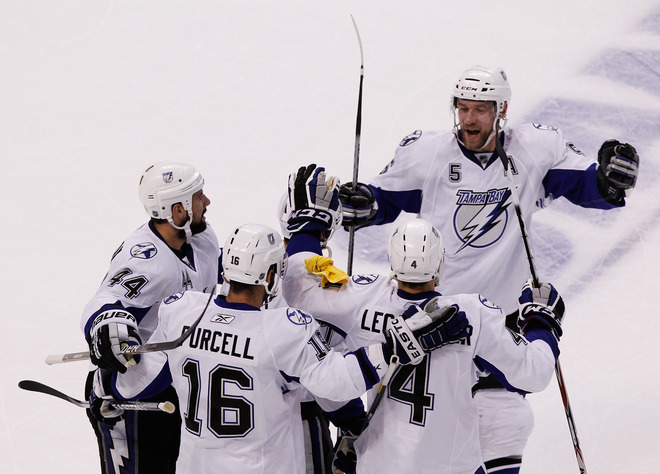 Three goals in 85 seconds in the first period were more than enough to put the Lightning over the Bruins in Game 1. Those goals came on defensive breakdowns and rusty goaltending. Sean Bergenheim opened the scoring before Brett Clark scored 19 seconds later and then Teddy Purcell added an unassisted goal soon after. Tyler Seguin would respond with a late first period goal but that was it. Marc-Andre Bergeron put a bow on it with a power-play goal late, sealing the first game of the series. The Bruins offense looked out of sync throughout the game and the power-play went 0-for-4. Patrice Bergeron was clearly missed on the penalty-kill and in the faceoff dot where the Lightning dominated. The game got off to a slow start with a ton of stoppages in the first few minutes with both teams looking cautious and content to play a slower game than they are used to. After the jitters wore off both teams would have early chances snuffed out by blocks by defensemen within about 30 seconds of each other. The Bolts would get the first goal when Sean Bergenheim got a third rebound on the doorstep and finally put it past Tim Thomas in traffic. Bergenheim’s effort was greatly benefitted because Dennis Seidenberg lost his stick seconds before. Seidenberg was the last line of defense but couldn’t poke away the loose puck. Things immediately got worse when Tim Thomas let in a softy just seconds later. Brett Clark was able to go the length of the ice without much worry before flicking a backhander from inside the dot past Tim Thomas for the Lightning’s second goal in 19 seconds. The Lightning would get a third goal in short time when Tomas Kaberle turned the puck over behind the net and Teddy Purcell stole it and fisted two attempts on an unaware Tim Thomas. Thomas made the first save out of pure luck but the second one squeezed past him. Claude Julien called a timeout but did not pull Thomas, looking to get his team’s head back in the game instead of panicking. Tyler Seguin of all people got the Bruins on the board with a great individual effort. Michael Ryder fed Seguin as he crossed the blue line, Seguin quickly deked left before curling off a shot low glove side to get the Bruins on the board with 4:01 left in the first. The game would settle down after the goal comparatively speaking but it looked like the Bruins were back into the game after a terrible 90 seconds yielded a three-goal hole. The first power-play went to the Lightning when Daniel Paille was sent off for tripping early in the second period. Just as the power-play was expiring Steve Downie was sent off when he cross-checked Seidenberg in front of the net. The Bruins couldn’t even set up in the Tampa Bay zone, allowing multiple clears in a frustrating two minutes for the Bruins who had hoped to get back momentum with the man-advantage. The Bruins would soon after get another power-play thanks to an Eric Brewer trip. After an initial scare by Tampa the Bruins power-play turned in a good effort but couldn’t get anything past a sound Bolts kill. The penalty fest would continue when Chris Kelly was sent off after a great few minutes by the Bruins, giving the Lightning a chance to put the game out of reach just after the halfway point of the game. The Bruins put together a strong kill and kept the game within reach. David Krejci drew another penalty deep in the Tampa zone and the Bruins would get another critical power-play with five minutes left in the second period. This power-play would take a step back but had a good opportunity when a Kaberle shot narrowly missed from the blue line. The Bruins would get their fourth power-play of the game six minutes in with every second becoming more and more critical. The first half of the power-play was atrocious but the second half showed a lot of possession and movement in the zone. Kaberle once again got a good shot on net but hit the wrong side of the strings on a one-timer. The Lightning did a great job in the third of bottling the Bruins up despite the Bruins pressuring often. They made sure to keep their goalie safe through blocked shots and getting to loose pucks against the Bruins lackluster offense. The Bruins chances seemed to dwindle when Johnny Boychuk was called for roughing after a big clean hit by him drew a reaction from Vinny Lecavalier and Boychuk was caught taking a swing at the Bolts captain. Marc-Andre Bergeron would put the game out of reach with a seeing eye shot from the blue line. The fluttering puck seemed harmless but waffled off the net and in past a screened Tim Thomas who really didn’t have much of a chance. With the air sucked out of the building the Bruins decided to pull their goalie with 2:45 left in the game with nothing else to lose. Simon Gagne would quickly add a cheapie 15 seconds later. The Bruins would get a second goal in garbage time, this time by Boychuk when a hapless shot deflected off of Bergeron’s skate and in with a minute left. Things got ugly late with Milan Lucic and Nathan Horton taking pot shots after a whistle, getting the Bolts a brief 5-on-3 to end the game.